Kevin McGrath is the founder of McGrath Consulting. He leads the team, providing planning advice and portfolio consulting. After retiring from the United States Marine Corps in 1994 as a selected Lieutenant Colonel, where he flew A-4M Skyhawks, Kevin joined UBS Financial Services Inc. He is a graduate of the University of South Carolina. A CERTIFIED FINANCIAL PLANNER™ and Chartered Special Needs Consultant®, Kevin holds Series 7, 8, 63 and 65 securities licenses as well as Health, Life, Long-Term Care, Variable Life and Variable Annuity insurance licenses. He maintains active membership in the Financial Planning Association of Georgia; Academy of Special Needs Planners; Atlanta and North Georgia Estate Planning Councils; Georgia Planned Giving Council; Georgia Society of Association Executives; and Association of Fundraising Professionals. He is a graduate of the Philanthropic Advisor Leadership Institute (PALI). 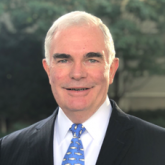 Kevin volunteers as an American Cancer Society National Professional Advisor, Children's Healthcare of Atlanta Legacy Advisor and as a mentor to transitioning veterans with American Corporate Partners. An avid fly fisherman, Kevin holds several International Game Fish Association (IGFA) world records. While active in Trout Unlimited, he has served in numerous leadership roles including the Chairman of the Georgia Council of Trout Unlimited’s Back-the-Brookie Program and President of the Upper Chattahoochee Chapter of Trout Unlimited. Kevin has been honored with several sporting and conservation awards, including being named a Field & Stream Magazine Hero of Conservation. He is also an International Federation of Fly Fishers Certified Fly Casting Instructor. Kevin and his wife reside in Roswell, GA. They have been married 35 years. McGrath Consulting helps families and individuals, especially those with special needs, plan for near term and lifelong goals. We provide objective advice to trustees, attorneys, accountants and allied professionals, helping them effectively serve their clients. We take a team approach simplifying the challenges that come with protecting, growing and transitioning wealth. We offer the experience to manage your complex planning and financial needs with a commitment to understanding your goals, wherever you are in life. Our clients benefit from proactive service, including: intergenerational planning, prompt response and scheduled monthly contacts with quarterly performance reviews. Relationships are highlighted by financial planning, special needs planning, investment management and fiduciary support for trustees and conservators. Backed by the extensive resources of UBS, we can help you to create a comprehensive, goals-based plan for managing and safeguarding wealth. We work with an entire ensemble of dedicated professionals, from experienced trust and estate specialists to experts in retirement, insurance and investments, making sense out of all the moving parts of your finances. Consulting on more than $1 billion dollars of client assets, we draw on over 25 years of consulting experience as well as the depth and breadth of UBS' global resources to customize wealth management solutions for you. With more than 150 years of wealth management expertise at its core, and drawing upon an integrated mix of investment banking and asset management businesses, UBS focuses on providing relevant guidance, differentiated global perspectives and diverse strategies and solutions for private, corporate and institutional clients worldwide. UBS Financial Advisors are dedicated and passionate professionals who recognize that financial goals and life goals are uniquely intertwined. Through a comprehensive, yet customized approach, they access the deep resources and wealth management expertise of this firm, to deliver the trusted financial advice clients seek today to confidently move forward.